As many of you know, I recently brought a foster cat named Mango into the Dr. D household. 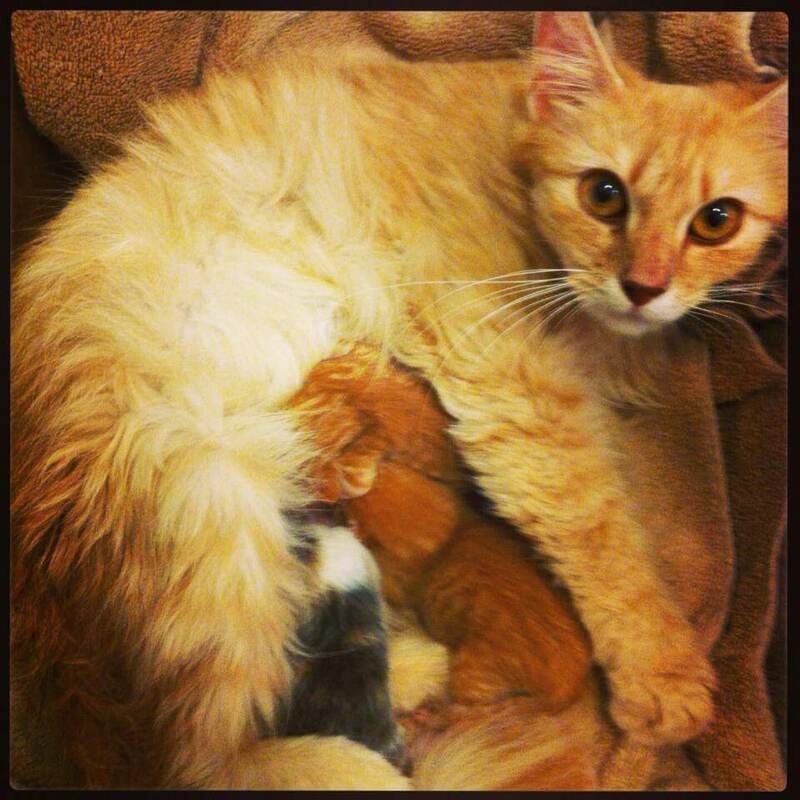 She’s a three year old, domestic longhair cat who had a litter of kittens in our care about 4 weeks ago. Mango is unbelievably sweet, even allowing my four year old son to carry her around, and my dog Maeby to nuzzle her. Mango doesn’t get along quite so swimmingly with our cat Phoebe, however. On the scale of inter-cat issues, ours are currently only at a three out of ten, but the occasional howls and screams from both cats are alarming to hear. It’s usually not easy to introduce two adult cats to each other. Senior and geriatric female cats, in particular, seem to be least tolerant of new feline additions to the household. 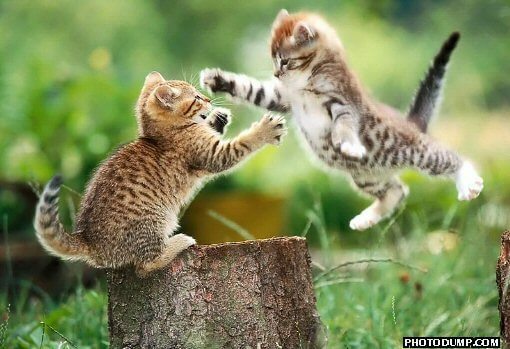 Kittens may be better accepted by adult felines, but there’s no guarantee Fluffy will be tolerant of a feisty young upstart, either. What can be done to smooth the introduction of a new cat? The first key is to allow NewCat time to adjust to your home for several days, without any direct interaction with ExistingCat. NewCat will potentially hide under a bed or in a closet for a few days; NewCat should have separate food, water and litter pans until she seems more comfortable in her new environment. Once NewCat is out and about, socializing with the humans in the house, then she can be allowed controlled, supervised interactions with ExistingCat. Allowing ExistingCat to enter NewCat’s room may cause NewCat to feel threatened, so ideally the introduction should be done on “neutral” ground in the house. If one or both cats run and hide, so be it. They may need additional time to acclimate to each other. If the cats hiss or growl at each other, stomp your foot or clap loudly to stop the behavior; this can be done anytime you hear those unmistakable feline howls. 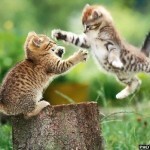 If the cats try to scratch or bite each other, try to startle them with a loud noise (stomping or clapping); don’t try to break up any altercations with your hands or feet, as ExistingCat or NewCat could turn on you. If need be, squirt them with water or use a broom to separate them. Ideally, none of these things will happen and both kitties will happily co-exist from the get-go. Any time both cats are in the same room, acting appropriately toward each other, they can both be rewarded with treats to reinforce the desired behavior. Many intercat aggression problems stem from competition for resources, such as access to litter pans, food, or the sunniest spot on the carpet. It’s vitally important that both cats have separate access to litter and food, where they can eat and eliminate in peace. Both cats should have access to different beds, climbing perches and toys. NewCat and ExistingCat will each need exercise and activity, provided by you, as well as separate times for affection. If NewCat and ExistingCat are not fast friends, introducing a feline pheromone called Feliway may help decrease anxiety. 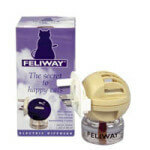 Feliway is a synthetic version of a feline facial pheromone, which can be emitted via a diffuser (similar to a Glade Plug-In air freshener); this product is known to have a calming effect on many felines. It has no odor that humans can detect, and no side effects. I recommend Feliway to my clients often, since it can help with aggression, inappropriate urination and many other kitty behavioral troubles. Finally, if all these tactics have been unsuccessful, it may be time to consider a trial with Prozac (fluoxetine) for the aggressor cat. Fluoxetine is a selective serotonin re-uptake inhibitor (SSRI) that can decrease anxiety; since many cases of feline aggression are rooted in anxiety, using anxiolytic medication is often successful in reducing or eliminating the unwanted behavior. Have a thorough discussion with your veterinarian about the pros and cons of this medication. Fluoxetine has a high index of safety in healthy patients; it is cost-effective and easy to administer since it’s given only once daily. However, it can take 3-4 weeks to reach effective levels in the bloodstream, and in a small percentage of patients may “disinhibit aggression”, or make aggression worse. See my previous blog post, “Better Living Through Chemistry” for more on fluoxetine and your pet. 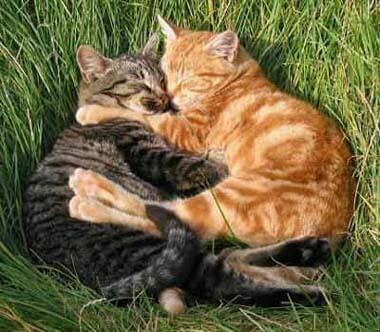 In most cases, two adult cats can learn to peacefully co-exist. They may not curl up together in front of the fire, but NewCat and ExistingCat often reach a detente, where the fur stops flying and the howls subside. 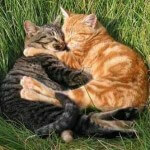 In some instances, cats never learn to get along; in this circumstance, life may be too stressful for all parties, and it’s in everyone’s best interest to find a happier home for NewCat. If you are thinking about bringing a new cat into your home, please ask your veterinarian for advice about which cat might be the best choice. Mango (NewCat) and Phoebe (ExistingCat) manage to co-exist most of the time, and Mango will be returning to her original owners in another month, when her kittens are weaned. We are making the best of a cranky cat situation at the Dr D household, mainly because we have 3 adorable kittens to enjoy!